This memorial website was created in memory of our loved one, Stuart Loory, 82, born on May 22, 1932 and passed away on January 16, 2015. Where Stuart Loory is buried? Locate the grave of Stuart Loory. How to find family and friends of Stuart Loory? What can I do for Stuart Loory? was an American journalist and educator. Loory was born in Wilson, Pennsylvania. He grew up in Dover, New Jersey, where his parents, Harry & Eve Loory, owned a large furniture store. Along with his younger brother, Melvyn, he attended prep school at Blair Academy. Loory graduated from Cornell University in 1954 where he was a member of the Quill and Dagger society and editor-in-chief of The Cornell Daily Sun. After three years at the Newark News, he received a Master's degree in journalism from Columbia University in 1958, and did postgraduate work in Vienna, Austria. Note: Do you have a family photo of Stuart Loory? Consider uploading your photo of Stuart Loory so that your pictures are included in Stuart Loory's genealogy, family trees & family history records. Sysoon enables anyone to create a free online tribute for a much loved relative or friend who has passed away. Address and location of Stuart Loory which have been published. Click on the address to view a map. Stuart Loory was born in United States. 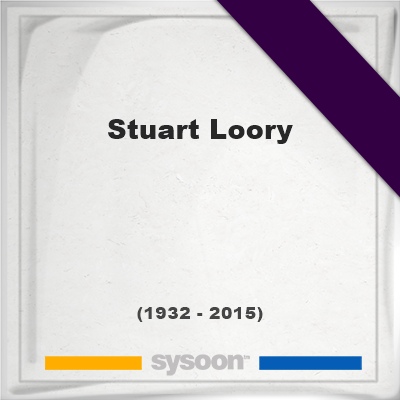 Stuart Loory died in United States.